The National Park Service is evaluating the Memphis Cobblestone Landing for individual listing in the National Register of Historic Places. Approval would be another plus for downtown Memphis, a point of pride for our community, and an economic boon for cultural tourism. Unanimously recommended by the Memphis Landmarks Commission and the TN Historical Commission, the nomination was prepared by architectural historian Judith Johnson, a founding member of Friends for Our Riverfront, and underwritten by a grant from the Crawford-Howard Foundation. It focuses on the Landing’s role as a transportation hub for the trading of cotton and the economic, political, and social contribution of African Americans in the development of the U.S. as a global trading power. As Mayor A C Wharton says the Landing is not just old; it tells a story of national importance that has not been told previously. The nomination has also been supported by the Shelby County State Legislative Delegation and by U.S. Congressman Steve Cohen. Rep. Barbara Cooper, in whose district the Landing is located, attended and spoke on behalf of the Landing's significance to the TN Historical Commission Review Board. For more than 100 years, cotton comprised over 50% of the GNP of the U. S. and fueled the Industrial Revolution worldwide. It was as important in terms of wealth, politics, and history in the 19th century as oil is today. Cotton was King. Southern states produced it; Northern and European mills finished it. The enormous wealth it generated was built on the greatest tragedy in American history, and the South went to war to keep the economy going and the slave system intact. The strings of cotton were long and the economies of Memphis, New York, New Orleans, and Liverpool, among others, were closely connected. 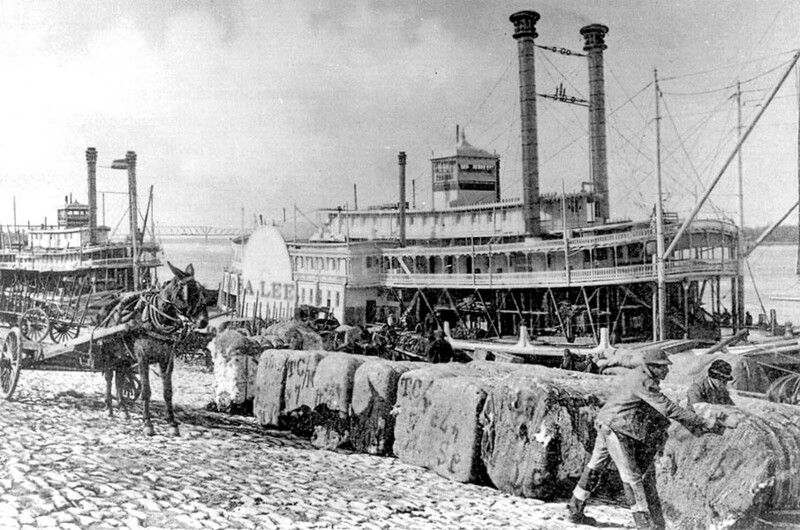 The trade caused steamboats to flourish on the Mississsippi River and the Memphis Landing to be paved with cobblestones and filled with stevedores loading and unloading the white gold. During the Civil War, the wealth generated by cotton corrupted Northern soldiers and, after the war, attracted Northerners to the South as farmers and cotton traders themselves. African-Americans as freemen found little welcome outside the South and few opportunities off the cotton farm until World War I. The social and economic caste system eventually would lead to the Civil Rights movement. The history of the Memphis Landing tells these stories and more. National recognition of the Landing has been a City goal since the Bicentennial Legacy program in 1995. According to the Memphis Convention and Visitors Bureau, cultural tourism accounts for 81% of the tourist visits to Memphis, which brings in $3.1 billion in visitor expenditures, $2 billion in payroll, and $131M in local and state taxes. National recognition of the Landing would not only be a point of pride for our community, but could bring increased funding for restoration of the Landing. Click HERE to read the nomination.